The report finds that 75% of wrongful convictions overturned through DNA testing involved eyewitness misidentification. 17 states in last two years have considered reforms. The full report is here (pdf). 240 people, serving an average of 12 years in prison, have been exonerated through DNA testing in the United States, and 75% of those wrongful convictions (179 individual cases as of this report) involved eyewitness misidentification. In 38% of the misidentification cases, multiple eyewitnesses misidentified the same innocent person. Over 250 witnesses misidentified innocent suspects. In 2006, a report called the Illinois Study was released. It claimed that double-blind sequential lineups did not produce more valid eyewitness identifications. Prosecutors have since relied on that study to contest 30 years of research that shows they are more reliable than simultaneous identification procedures. Now, a new report is out by leading researchers in the country finding that the Illinois study was flawed. A blue ribbon panel of social scientists, convened by the Center for Modern Forensic Practice of the John Jay College of Criminal Justice, said the Illinois Eyewitness Identification Field Study, which challenged 30 years of academic research into eyewitness identification procedures, was itself crippled by a design flaw that made the study's conclusions a dangerous basis for shaping public policy. The Eyewitness Identification Reform Blog says there's no way to put lipstick on this pig. The new findings are available here (pdf). Good news from New York. An appeals court has reversed a murder conviction because the Judge refused to allow an expert is eyewitness identification to testify. The 13 page opinion is here. For the reasons that follow, we hold that where the case turns on the accuracy of eyewitness identifications and there is little or no corroborating evidence connecting the defendant to the crime, it is an abuse of discretion for a trial court to exclude expert testimony on the reliability of eyewitness identifications if that testimony is (1) relevant to the witness's identification of defendant, (2) based on principles that are generally accepted within the relevant scientific community, (3) proffered by a qualified expert and (4) on a topic beyond the ken of the average juror. Taking into account that trial courts generally have the power to limit the amount and scope of evidence presented, we nevertheless conclude that, in this case, the court erred when it precluded the testimony of defendant's eyewitness identification expert in its entirety. I have corresponded with one of the authors, a Public Defender, and the blog is the real deal. They will be blogging tomorrow through Saturday from the "Off the Witness Stand Conference" at the John Jay College of Criminal Justice in New York. The conference is named for Dr. Munsterberg's collection of essays, "On the Witness Stand," which urged the courts to open their doors to a plethora of social science findings that cast serious doubt on assumptions commonly relied on in criminal proceedings. Speakers include: Janet Reno, Steven Penrod, Gary Wells, James Doyle, Saul Kassin and Tim O'Toole. 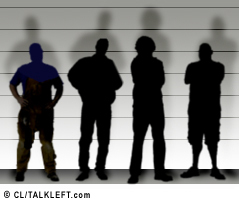 Mistaken eyewitness identification is the largest cause of wrongful convictions. New Mexico has a bill pending that would greatly reduce the chances of misidentification. A hearing is scheduled today on the bill. Under the proposed regulations, an eyewitness must provide a written description before a lineup takes place; there must be at least six individuals in a live lineup and 10 photos in a photographic line-up; and the members of the lineup must be shown sequentially rather than simultaneously. Innocence Project co-director Barry Scheck explains in this letter (pdf) why the bill is so critical to justice. The bill is Senate Bill 5. You can read the text here.